Every nation in the history of its existence leaves indelible art heritage in the form of monuments, paintings, works of literature, architecture, and of course, music. The music in the history of Armenia has played an enormous role in the formation of the national consciousness, self-identity, culture and spiritual values. Let’s dive into the wonderful world of Armenian music and study the most outstanding aspects from its origins to the present day. Armenian musical culture originates from the II millennium BC, as evidenced by the ancient Armenian historians Movses Khorenatsi and Pavstots Byuzand. Since 301 AD, with the adoption of Christianity as an official religion, the Church gradually began to develop spiritual music. In the development of sacred music, a greater role played the creation of the Armenian alphabet in 406. In the monasteries, which were both spiritual and educational centers, taught music, and thanks to the letters created by Mesrop Mashtots the texts have survived. Folk music, as opposed to the church, was passed on from generation to generation by oral tradition. Folk singers – ashugs – sang praises to the worldly life, with all its troubles and sorrows, joys and emotions, sang about the love towards the motherland, nature, parents, woman. Another interesting fact: lyrics were directly dependent on the area where the people lived. For example, in mountainous areas music used to be rebellious, angry and furious, because there was a constant struggle of man with nature, stone, storm, thunder, and lightning. In contrast, among the people living in the plain, were common more peaceful, gentle, soft melodies appropriate to their nature. 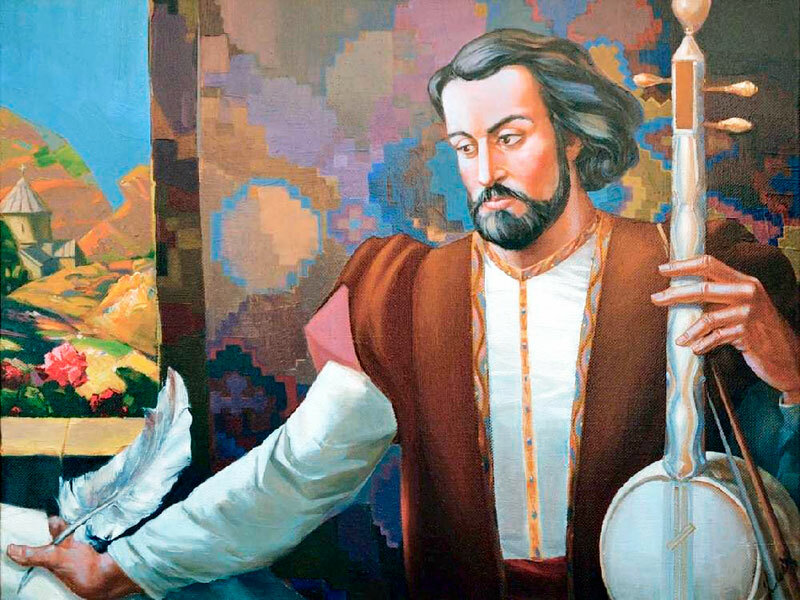 One of the most celebrated representatives of the Armenian folk art is ashug Sayat Nova. His figure is important not only in the Armenian musical art, but also in Georgian. The songs of Sayat Nova are still relevant, actively performed by modern Armenian folk singers and ensembles. The most outstanding and important representatives of the Armenian classical music are Aram Khachaturian, Komitas, Alexander Spendiaryan. Let’s get acquainted with each of them. The forefather of modern national classical music in Armenia is Komitas. He played a key role in reviving of the folk music. The great composer was born in the Turkish city of Kutahya in 1869. Composer, singer, music ethnologist, and musicologist, teacher and tutor, Komitas at the age of 12 years entered the seminary at Echmiadzin. At college he studied religious music, folk songs making creative efforts to collecting them together. In 1915, after the nightmare of genocide and exile, he lost his mental equilibrium. In 1919, he moved to Paris, and until his death (22 October 1935) was treated in psychiatric hospitals. 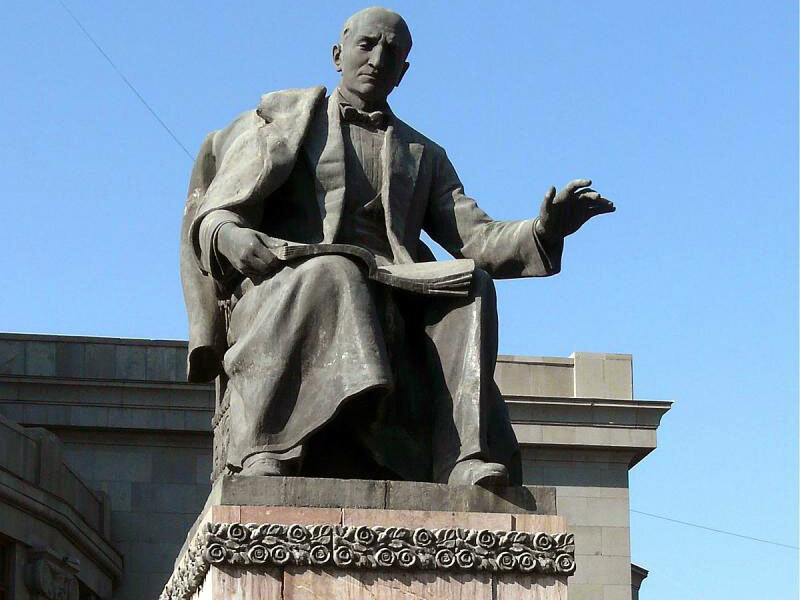 In 1936, his remains were transferred to Yerevan, where he was buried in the Pantheon of Komitas, named in his honor. Until now, every Armenian, regardless of where in the world he lives recalls the name of the great composer, who became the hallmark of Armenia globally, with great honor and respect. A new period of activity begins thanks to Alexander Spendiaryan, whose name has its unique place in the history of classical music. A genuine composer, a talented conductor, considerate young teacher, Alexander Spendiaryan is one of the founders of the symphonic music. Educated in the best traditions of European and especially Russian classical music, he has widened the scope of the Armenian national and folk music. He laid the basis of symphonic music, chamber music, enriching it with numerous works, the most outstanding of which is the opera “Almast”. 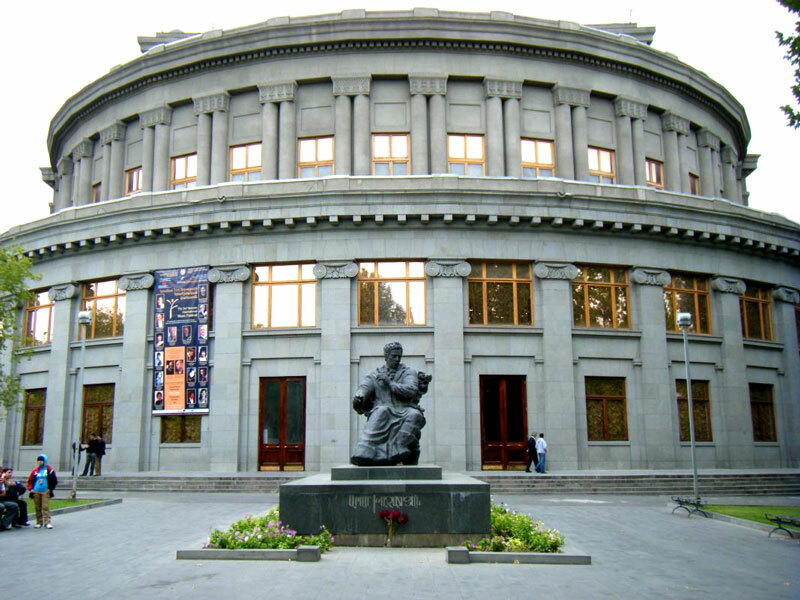 The State Academic Opera and Ballet Theatre which is located in the heart of Yerevan is named in honor of the great composer. His name is recognized all over the world, and the compositions are performed on the best theater stages and concert venues. The UNESCO puts the name of Khachaturian among the most famous composers of the 20th century, and his “Sabre Dance” from “Gayane” ballet as well as the music for the ballet “Spartacus”, occupy one of the first places in the list of the most popular symphonies of the century. “Whatever I wrote, all sounds in Armenian”: that’s the symbolic confession of the great Armenian composer Arno Babajanyan. Arno Babajanyan was born in Yerevan January 21, 1921. The composer can be called “Yerevantsi” to the backbone: his music is literally saturated with love for Yerevan. Aram Khachaturian and Sergei Rachmaninoff had great influence on the works of Babajanyan. His rich artistic heritage includes songs, instrumental music, and symphonic music. He has worked in a variety of styles: classical, pop, jazz. His songs can be heard in the most of the famous Soviet films: “The First love song”, “The Mechanics of Happiness”, “The Bride from the North”, and so on. His enchanting compositions for piano are familiar to millions from the very first notes: “Elegy”, “Nocturne”, “Armenian Rhapsody” and so on. 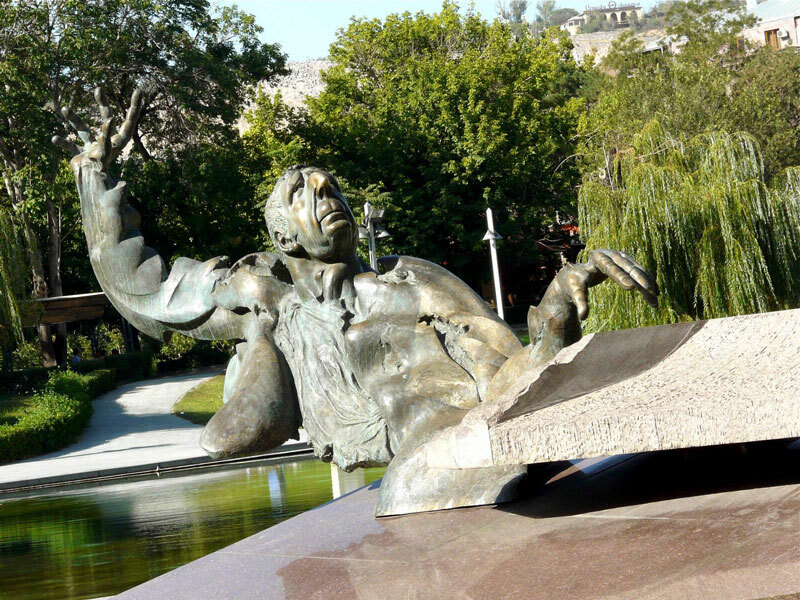 In 2003, Swan Lake, in the heart of Yerevan, there was a solemn opening of the monument to the great maestro Arno Babajanyan. In 2003, near the Swan Lake, in the heart of Yerevan, there was a solemn opening of the monument to the great maestro Arno Babajanyan. Armenia is a unique country! No matter what touches a hand of the Armenian master, whether it is painting, literature or music – everything has its own special, unique “Armenian flavor.” For lovers of jazz with Armenian accent, Yerevan is а truly paradise! The first jazz band of Yerevan was founded in 1936 by composer Tsolak Vardazaryan. In 1938, composer Artemi Ayvazyan for the first time in the USSR founded the Armenian State Jazz Band. The appearance of jazz in a Soviet republic is indeed a unique fact, as the Stalinist regime in those days led rigid ideological policy, controlling all branches of life and preventing the penetration of anything foreign. 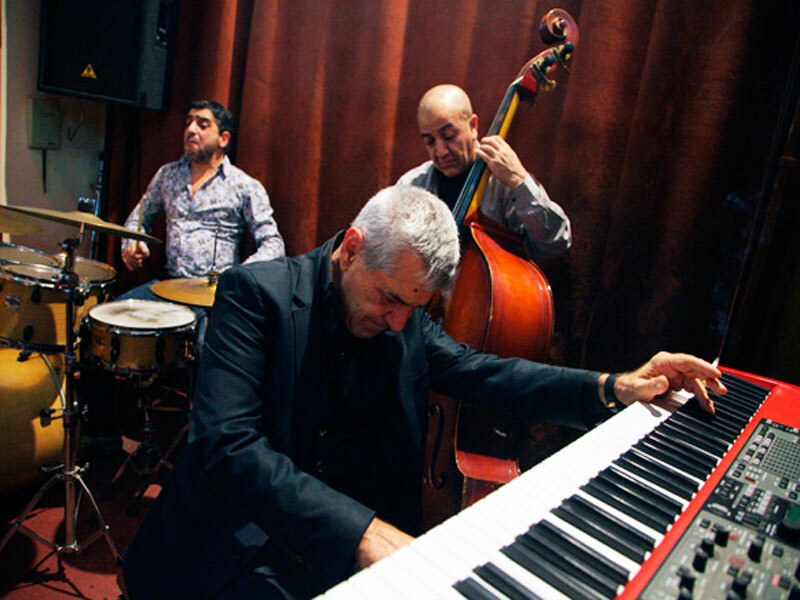 In Armenia, jazz is not just loved, it is worshiped. Among contemporary artists, some are internationally known like pianist Levon Malkhasyan, “Malkhas” and Tutunjyan Armen “Chico”. In 1998 Malkhas became one of the initiators of the international jazz festival in Yerevan. Among the leading contemporary jazz musicians and bands can be noted Armen Martirosyan (conductor and pianist), Vahagn Hayrapetyan (“Petian”, piano), Tigran Hamasyan (piano), Armen Hyusnunts (saxophone) and the magnificent «Armenian Navy Band» headed by Arto Tutboyajyan . Below, we want to introduce you to the jazz clubs, where you can enjoy live music performed by both great musicians and talented young performers. Malkhas Jazz Club is located on Pushkin Street 52/1. The club is open 7 days a week from 11: 00-04: 00. Every day from 21:00 to 02:30 Malkhas Jazz Club presents a program of jazz music, with legends of jazz – Levon Malkhasyan and Aramo. The entrance fee is 2000 AMD. Avantgarde Folk Music Club can be found at the address Pushkin 3/a. Here you can enjoy authentic Armenian music of different styles and genres – folk, jazz, New Age, Folk Rock – with native Armenian music roots, rhythms and harmony. Arto Tutboyajyan Armen Hyusnunts Vahagn Hayrapetyan and other world-renowned Armenian musicians often play here. Along with the music, the club serves original Armenian cuisine. CLUB 12 is on the street of Teryan, 91. The restaurant is open from 12:00 to 04:00. Club program is always different and novel. It has its own atmosphere and you can plunge into the world of jazz with Armenian motives and enjoy a hookah, delicious cuisine, and colorful interiors. MEZZO Classic House Club is an upscale complex located in the heart of Yerevan, on Isahakyan Street, 28. Each night club opens its doors to lovers of live music in various genres: jazz, rock, blues, Latin and classical. The club also organizes live performances of domestic and foreign popular singers and bands. Do not miss the performance of the legendary musician Richard Bona in the framework of International Jazz Day with Richard Bona in MEZZO April 30, 2016! Yans Club Music Hall and Restaurant is a unique high-class music hall and restaurant with an exclusive interior and excellent cuisine. Yans Club has set new, higher standards which meet all the perfectionist demands. Since its opening, the Yans Club is characterized by respectability and sophisticated, delicate taste. Every day the best Armenian and foreign music ensembles and soloists play on the stage of Yans Club Music Hall. Cafesjian Center for the Arts is a unique complex dedicated to modern Armenian art. The center is located on the famous Cascade, which is a set of massive stairs and fountains. In the center, in addition to the exhibition halls and galleries, works Cafesjian Center for the Arts Music Series which hosts the Armenian Jazz Band, State Jazz Orchestra of Armenia, the ensemble «Cats», Chicco and friends, the Dorians, and many other famous musicians. The Center is doing everything for the promotion of contemporary arts in the country and abroad: a concert ticket gives you the right to a one-time free admission to all galleries within one week. Please contact us and we will arrange your cultural holiday in one of the most musical capitals of the world!